The Women on the Rise! Annual Girls Summit offers access to the best practices in girls education presented by scholars conducting innovative work in and out of South Florida. Addressing issues of body image, health, sexuality, and gender non-conformity, leading educators, scholars, and activists engage in performances, panel discussions and film screenings, which highlight innovative scholarly work in gender studies and girls education. The 2014 program will focus on the creativity of girls, nurturing that creativity and the empowering potential of expression. Current and previous Women on the Rise! instructors and partners reflect on the evolution of the program and how gender-specific education has changed over the last 10 years. They will conclude with projections on the future of girl-programming. A collaborative multi-media performance based on feminist art outreach work with girls in the Miami-Dade Regional Juvenile Detention Center, and WINGS, a residential program for adolescent mothers involved in the justice system. Discussion on creative outlets of expression and collaboration with arts organizations providing essential programming, particularly within the GLBTQ community. This presentation will be a multimedia experience of SOLHOT (saving our lives hear our truths), a collective practice of celebrating Black girlhood in all of its complexity. Dr. Ruth Nicole Brown, in collaboration with T.R.U.T.H and members of SOLHOT (Porshe Garner and Jessica Robinson), will perform original music that speak to the possibilities of a visionary Black girlhood dependent on Black girls’ genius. Based in central Illinois, the SOLHOT program uniquely utilizes dance, song, art, activism and discussion to improve communities and create spaces of affirmation. Mid-career survey of Kenya-born, New York-based artist who multi-faceted work articulates 21st century global sensibility. This site-responsive exhibition compiled with objects sourced from the area around the exhibition site reframes the relationship between work and the environment. INOCENTE is an intensely personal and vibrant coming of age documentary about a young artist’s fierce determination to never surrender to the bleakness of her surroundings. It is both a timeless story about the transformative power of art and a timely snapshot of the new face of homelessness in America, children, in the very real, day-to-day existence of a young girl who is battling a war that we rarely see. Jillian Hernandez, Ph.D., Assistant Professor of Ethnic & Critical Gender Studies, University of California, San Diego will discuss how the alluring, flamboyant, and otherworldly aesthetics of the female bodies in Wangechi Mutu’s work embody black womanhood as beautiful, and black female (hyper) sexuality as pleasurable. THEESatisfaction is a R&B hip hop duo based in Seattle where they write, produce and perform their own material they describe as” funk-psychedelic feminista sci-fi epics with the warmth and depth of Black Jazz and Sunday morning soul, frosted with icy raps that evoke equal parts Elaine Brown, Ursula Rucker and Q-Tip.” They have recently performed at the SXSW Festival for the second year in a row where they were called ”the feel good act of the festival,” the Women’s Jazz Festival in Harlem, the TreeFort Music Festival in Boise, ID, the Siren Nation Festival and are integral performers at Black Weirdo Parties held in major cities in the US and Canada. Their album “awE naturalE” was released in 2012. Click here for a description of each presenter! 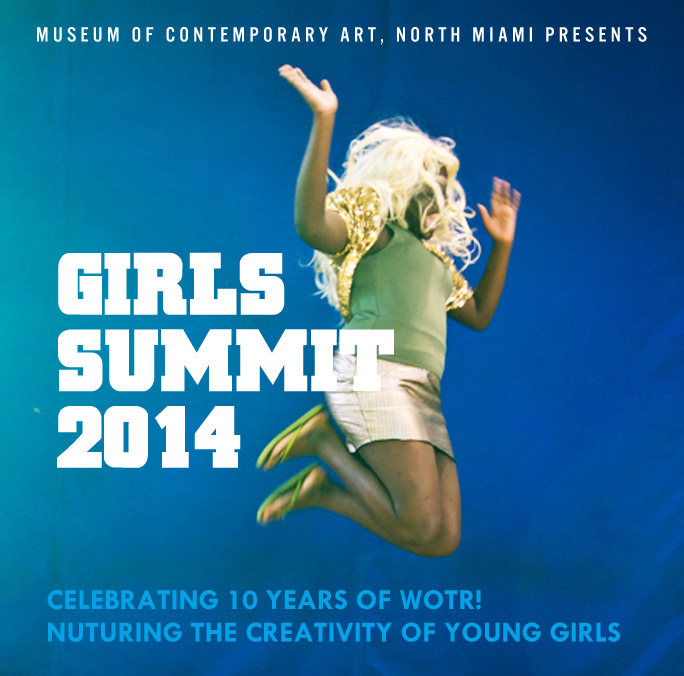 The 3rd Annual Girls Summit is organized by Crystal Molinary, Director of MOCA’s Women on the Rise! and Dr. Jillian Hernandez, Founder of Women on the Rise! and Assistant Professor of Ethnic and Gender Studies at the University of California San Diego. The 3rd Annual Girls Summit is co-sponsored by DeliverLean and the Aqua Foundation. The Women on the Rise! program addresses the needs of underserved girls and young women through the study of contemporary women artists as positive role models with the intention of boosting participants’ self-esteem, communication and social skills. Since its inception in 2004, WOTR! has served over 5,000 girls ages 12-18 through agencies such as the Miami Dade Juvenile Detention Center, Pridelines Youth Services, Casa Valentina, Honey Shine, Breakthrough Miami, the Robert Renick Educational Center, Urgent, Inc. and the Thelma Gibson Health Initiative Girls’ Group.